In a world where legends are being created every day in every field. The field of a startup is all set to create some superheroes. Every startup involves great effort and teamwork and passion. We at TBS planet believe every startup has a story to tell that could inspire people all around the globe. This time featuring Mrunal on his journey to set Xanthus. Xanthus is an IoT focused technology firm that builds smart, secure and scalable solutions. We know that each business is unique and we strive to complement each client with personalized services and solutions to improve their productivity, efficiency, and competitive advantage. We design solutions based on solid, objective business metrics like Return on Investment and Lower Total Cost of Ownership that give a direct visible benefit to each customer. We realized that though there were tons of custom software development companies out there, there were few if any that combined hardware with software to create solutions that are directly usable in the field. We are a team of technocrats with over 50 years of combined experience in the industry across verticals and technologies. Over 17 years in Architecting and Developing Solutions Enterprise and Consumer facing mobile apps Expertise across all Microsoft Technologies Industrial and process automation. We differentiate ourselves primarily by creating solutions that enable our customers to focus on their business while leaving the technology to us. This means that we are closely integrated into our customer operations, thus, enabling them to focus on business growth rather than business as usual affairs. 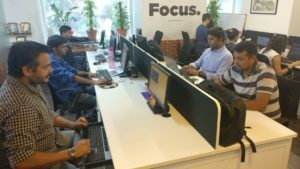 In spite of the growing concern over the future of IT and outsourced software in India, we believe that there is definitely an upside to companies such as ours who have moved away from the traditional software and manpower outsourcing models into the full service delivery models. We have a couple of products we are working on in the areas of Augmented Reality, RFID and IoT that we plan to focus on in the coming year. Our advice to budding entrepreneurs is to focus on their core competency and give very less time and effort to tasks which are not related to the core business operations. And no matter what happens don’t think of quitting everything will eventually work at last.